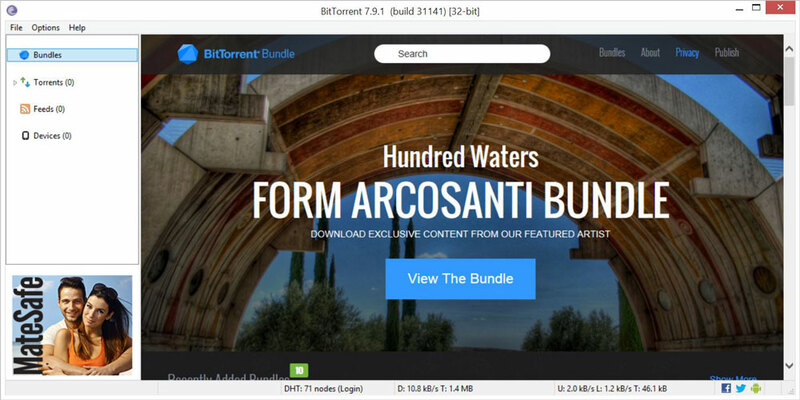 "Create, download, and share torrent files with BitTorrent." Let's face it, we all know what torrent clients are used for, mostly. Downloading pirated movies is probably their main use. And this review is neither in favor of pirated media or in opposition of it; however, if you're going to do it, we want to make sure you have the best tool for the task. BitTorrent is a torrent file management client that connects you with the torrents that you want to download and share. BitTorrent makes it easy to share large files amongst a large body of people. The built in torrent creation wizard gives you the necessary tools and options to create your torrents to be sent of the bittorrent network. Downloaders would need only a link to your shared file in order to begin downloading it inside of their BitTorrent application. The file can be saved directly to your Desktop, Downloads folder, or anywhere on your computer from the BitTorrent client. As more people download your torrent file, it increases its stability on the network and increases download speeds for other downloaders. The process mentioned above is called seeding. You can think of a torrent client as a garden, where the torrent file is the seed, and the seeders are the roots. As more people download the file, more seeds are spread about and the original torrent file is divided into pieces amongst all participating seeders. When another person comes to download the file, instead of downloading it from one connection, he/she will connect to multiple seeders at a time in order to get the download faster.